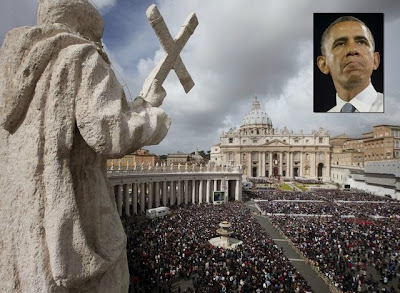 Barack Hussein Obama's ongoing assault on the Catholic Church is doomed to failure and will ultimately discredit and undo the inept, Indonesian immigrant who illegitimately occupies the White House. From Diocletian to Hussein Obama, persecutors have an astonishingly unbroken record of failure in their attempts to destroy the Church. It can also be amusing to see all the many ways Obama drives his approval ratings down to historic lows. Unfortunately, with his utter disregard for the Constitution, Obama and comrades will likely become more dangerous and destructive as his political situation deteriorates. Now he is attempting to reverse another of President Reagan's initiatives - the US-Vatican partnership which facilitated the collapse of Soviet communism.